Boxwood shrubs – as hedges of different sizes, clipped shapes or growing naturally – are the backbone of the structure of many gardens. Boundaries and edgings are the easiest way to bring order to a garden, and make your other plants stand out. 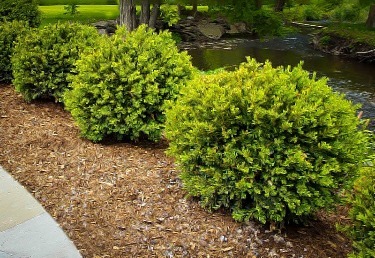 Whether its edging a path or driveway, adding accents around your home, or simply putting evergreen permanence into a bed of deciduous shrubs or flowering plants, boxwoods are naturals. Their small, glossy leaves have just the right density, and they are easy to clip, responding by growing denser and denser the more often you trim. As all-round structural plants, they are hard to beat. But if you want to be successful with boxwood, you need to make the right choices. Because of their popularity there are many different kinds and varieties, with different levels of hardiness, and growing into different shapes. So let’s take a look at the main types, as it makes no sense choosing an upright variety if you want to have clipped round balls, or even more difficult, planting low spreading types when you want something upright. First we need to sort out the main groups of boxwood shrubs. Boxwoods grow naturally all the way around the world, but most of them only grow in tropical and frost-free places. All the boxwoods grown in cool and cold parts of the USA are not native, but they have been around so long they seem like a ‘natural’ part of our gardens. When the first settlers arrived, they brought with them the European boxwood, Buxus sempervirens. This plant has been grown in America for so long that it is usually called ‘American Boxwood’. Although it can be clipped into smaller shapes, it will naturally grow several feet tall, so it’s a good choice for hedges over 3 feet tall, and up to 6 feet, although it will take some years to reach that height. It is also attractive grown more naturally, and it makes an attractive background evergreen in a smaller garden, since the small foliage is not visually overwhelming. Some time after boxwood was brought to America, Europeans, particularly the English, started growing a dwarf variety, Buxus sempervirens ‘Suffruticosa’. This form has very small leaves, and naturally grows just a few feet tall. It can easily be clipped into hedges as small as 6 inches tall, and it is idea for creating elaborate designs. The English and French loved it for their formal gardens, and when this plant was brought to America it became known as ‘English Boxwood’. Choose either of these boxwoods if you live in warmer areas, from zone 6 up, and choose the right one for the scale of your design. 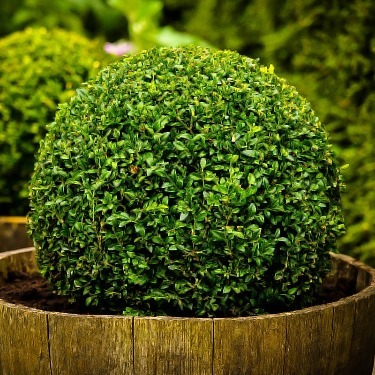 English Boxwood is perfect for small hedges and for clipped balls, such as you might put into pots to frame a doorway. American Boxwood is a good choice for taller clipped shapes, and for taller hedges too. Those early settlers in the north-east soon found that the colder winters did not suit the European boxwood, and winter damage – in the form of brown leaves, especially in taller plants above the snowline – was common. There were many new plants arriving from Japan and China, which had been opened up to trade, and among them were some forms of boxwood that were hardier, and much more suited to harsher climates. At first these new plants, coming from Japan, China and Korea, were all treated as one species, called Buxus microphylla. This name means ‘little leaf’, and this boxwood is often called ‘little-leaf boxwood’. This is a dwarf shrub, normally growing no more than 3 feet tall, but it is a full zone hardier than the European boxwood, so it is ideal in colder parts, perfectly hardy in zone 5, and usually hardy in zone 4, with very little winter damage. Forms coming from Korea and China showed themselves to be hardier than ones from Japan, and at first these were called Buxus microphylla var. sinica, or Korean Boxwood. However, botanists will be botanists, so these days it is more correct to call this plant Buxus sinica var. insularis. So when you see these two names on different plants, remember that they are actually the same thing under different names – it can be confusing! Korean Boxwood is the best Asian boxwood for colder areas, especially if you garden in colder parts of zone 5 and into zone 4. 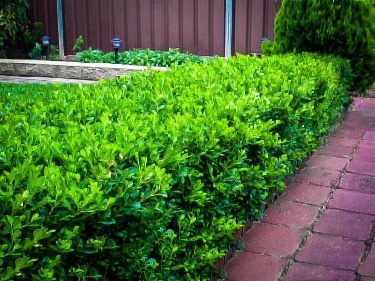 A particularly good choice of Korean Boxwood is the variety ‘Franklin’s Gem’. 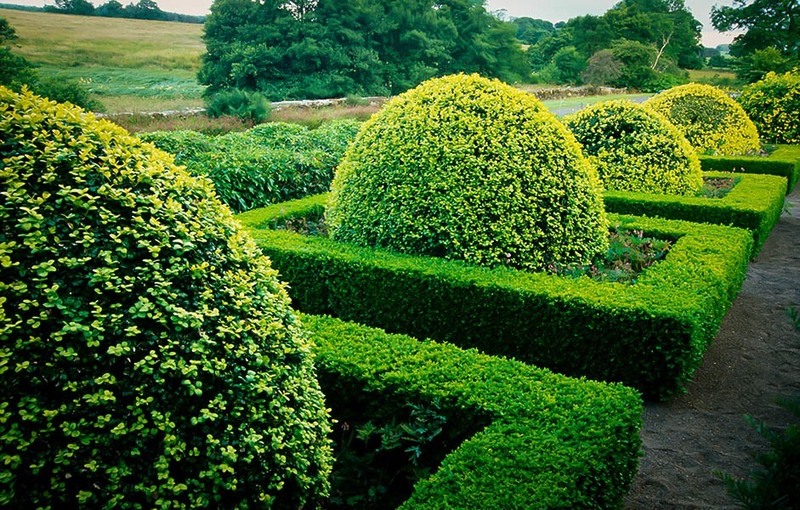 It is more compact, with tiny leaves, and makes perfect round balls that rival the English boxwood for density and neatness. Another good choice if you want neat, but don’t like to be clipping all the time, is ‘Wintergreen’, an naturally-dense form that is always neat, even if you hardly ever clip it. Those folks who garden in most of Canada really know what ‘cold’ means, and for a long time they had to garden without boxwoods, or they go to great lengths to protect them from the cold under wooden structures and burlap. So a big Canadian nursery called Sheridan Nurseries decided to do something about this. They started back in the 1950s crossing together English and Korean boxwood – not an easy thing to do – and then selected from hundreds of seedlings to find the hardiest. They also wanted to eliminate the tendency for the leaves of Korean boxwood to turn bronzy in winter, so that even when the snow went they looked unattractive until new growth appeared. After years of patient work they succeeded, and released several plants, some rounded and some more upright, that are the hardiest boxwoods of all, and ideal if you garden in zones 4 and 5. They stay green all year round, and they take cold weather better than any other forms. To make it easy, all these Canadian varieties start with the word ‘green’, so ‘Green Mountain’ is a taller, upright form, while ‘Green Velvet’ and ‘Green Gem’ are the perfect varieties to make rounded balls and low hedges. ‘Green Gem’ is in turn the parent of a variety called ‘Little Gem’, which is a selected form with even tinier leaves and denser growth – perfect for clipped plants in pots, or as a very short hedge. Now that we have all that sorted out, it’s going to be much easier for you to choose the right plant for your needs. Think about what you want to create – a short hedge, a taller one, cones or balls, and choose the best variety for its shape and origins, considering the zone you live in. In some parts of the country a nasty disease called Boxwood Blight is spreading in warmer, humid parts of the country. This virus disease turns the leaves brown, and it kills plants too. So even in warmer parts of the country gardeners are planting those hardier Korean and hybrid varieties, because it turns out they are a lot less susceptible to this disease than the traditional English and American boxwoods. Choose wisely and continue to enjoy the special look that only boxwoods bring to the garden.